One of the longest hold-outs from iTunes, AC/DC, finally reached the digital retailer last week. The iconic rock band’s entire catalog, along with two iTunes-exclusive box sets, became available on Monday, November 19. In the week ending November 25, the band’s 25 albums moved 48,000 downloads while its songs shifted 696,000 in the U.S. according to Nielsen SoundScan. Billboard.com reports that their biggest selling album, digitally speaking, was the band’s classic ‘Back In Black’, with 15,000 — more than 10,000 ahead of its second-biggest title, ‘Highway To Hell’ (a little under 5,000). Coming in third for the week was the brand new ‘Live At River Plate’ (4,000), followed by ‘High Voltage’ (just under 3,000) and ‘Dirty Deeds Done Dirt Cheap’ (2,000). In terms of song downloads, “Thunderstruck” led the way for AC/DC last week, selling 85,000. It debuts at No. 16 on Digital Songs and No. 1 on Hard Rock Digital Songs. On the latter tally — viewable on billboard.biz — the entire top 12 positions are owned by AC/DC tunes. The band’s second biggest seller last week was “Back In Black” (68,000), followed by “You Shook Me All Night Long” (64,000), “Highway To Hell” (50,000) and “TNT” (40,000). 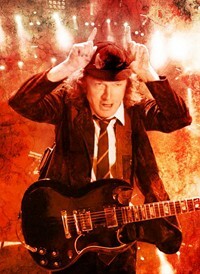 There were 14 AC/DC songs that sold at least 10,000 last week. Unlike the Beatles’ arrival on iTunes in 2010 — which was heralded with great fanfare and a TV marketing campaign — AC/DC’s entrance to iTunes seemingly dropped out of the sky without hype. Even though there weren’t TV commercials touting the iTunes debut (as there was for the Beatles), one could hear the song “Back In Black” in at least two different TV commercials over the busy Thanksgiving shopping weekend. It soundtracked spots for the video game “Call of Duty: Black Ops II” as well as Black Friday ads for Walmart.